Hi bei mir wird Akku Voll angezeigt obwohl er nur halb voll ist.Ansonsten gefällt es mir sehr sehr gut.Dankeschön!!! dass ein paar Sekunden lang nach dem Anstecken des USB-Kabels "Akku voll" angezeigt wird, liegt an der Programmierung des DNA-Chips. Diese (hier falsche) Anzeige verschwindet aber nach wenigen Sekunden und dann wird der korrekte Ladestand des Akkus angezeigt. Nach dem Verbinden braucht der Chip einige Zeit, um die Versorgungsspannung, den Ladestrom usw. zu testen. Während dieser Zeit stehen die Variablen in der Software auf "Connected = true" ("Verbunden = Ja" und "Charching = false" ("Laden = Nein"). Diese zwei Variablen nutze ich zur Detektion, dass der Akku voll geladen ist. Denn eben dieser Zustand der Variablen zeigt i.d.R. auch an, dass zwar eine Verbindung besteht, aber der Akku nicht (mehr) geladen wird, da dieser voll ist. So kommt es, dass nach dem Verbinden ein paar Sekunden lang "Akku voll" erscheint. Leider habe ich keine Möglichkeit gefunden, diese Eigenart des Chips zu umgehen. The fact that "Pack full" is displayed for a few seconds after plugging in the USB cable is due to the programming of the DNA chip. 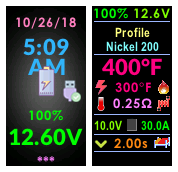 This (in this moment wrong) display disappears after a few seconds and then the correct charge level of the battery is displayed. After connecting, the chip takes some time to test the supply voltage, charge current Ampere, and so on. During this time, the variables in the software are "Connected = true" and "Charching = false". These two variables I use to detect that the battery is fully charged. For it is precisely this state of the variables defines also, that although a connection exists, but the battery is no (more) being charging, since it is fully charged. So it happens that after connecting for a few seconds "Pack full" appears. Unfortunately, I have not found a way around this peculiarity of the chip. Tried it on one device, and updated all 4 my DNA boxes to this theme half an hour later. It's got everything available on the mod. 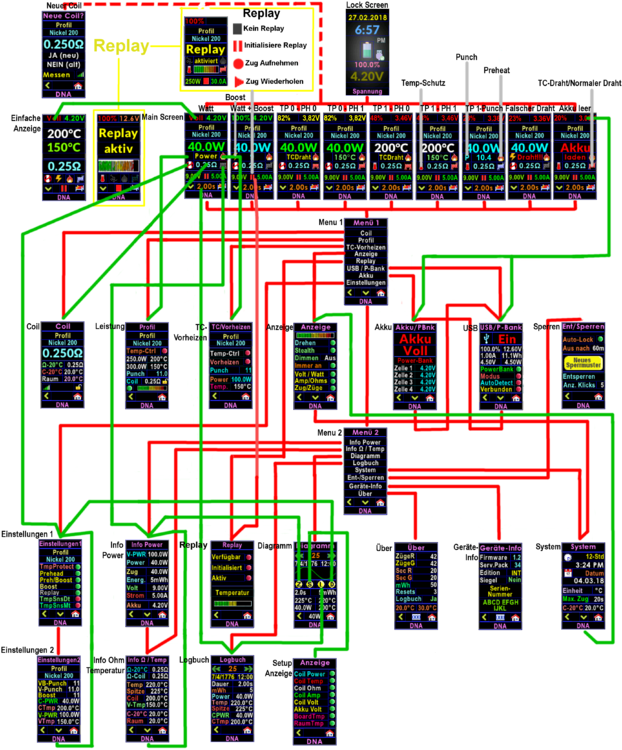 There's a lot of info on the screen, but it's displayed in a way that's not confusing me or makes me get lost, which happened with a few other themes that try to do the same thing. Everything works as is to be expected. My only remark (and it's something i can fix myself actually and it's totally subjective) is 3 of my 4 DNA boxes are 3D printed boxes. One of them has a screen that's installed just slightly crooked in the mod. This theme makes that very clear due to the white edge that's present on the screens. But as i said, it's something i can probably fix in theme designer myself. It's just the outside edge i'll probably delete. That's not really a shortcoming because of the theme, but a flaw of the mod and error by the modder. But this theme brings it out a lot more than other themes. I've always known it was crooked, but it just shows more with this theme. Not sure yet if I end up changing the theme in theme designer or to open up the actual mod to see if i can install the chip/screen straight. So super subjective con and very personal. Truly is a great theme. Best i've used. And thank you for the note with the border in my theme and the visibility of not correct mounted displays. You are quite right - in that case, the frame disturbs, because it makes manufacturing errors clearly. I will remove the border and leave only the horizontal dividing lines in the next update (will be finished until 09/16, as I hope). I tried many themes, and even learned about Theme Designer with one, before finally finding this gem. I instantly fell in love because it contains everything, is beautifully colored and mostly easy to read. I settled on the 'easy colors' version for my aging eyes. Of course I altered several things in there to make it easier for me to use and read - like changing the color of the status line to white (although thinking of green or yellow to keep it colorful). Many thanks for making this as complete as possible, and therefor for providing excellent examples of how I can utilize Theme Designer! Dadurch dass das V (= Volt) nicht mehr in eine Reihe passt verschiebt sich das V nach unten und somit keine richtige Anzeige. Of course I will fix that. Please give me a few days (until 09/16), then you can download a - a hopefully flawless - update of this theme. May I ask which mod you use? 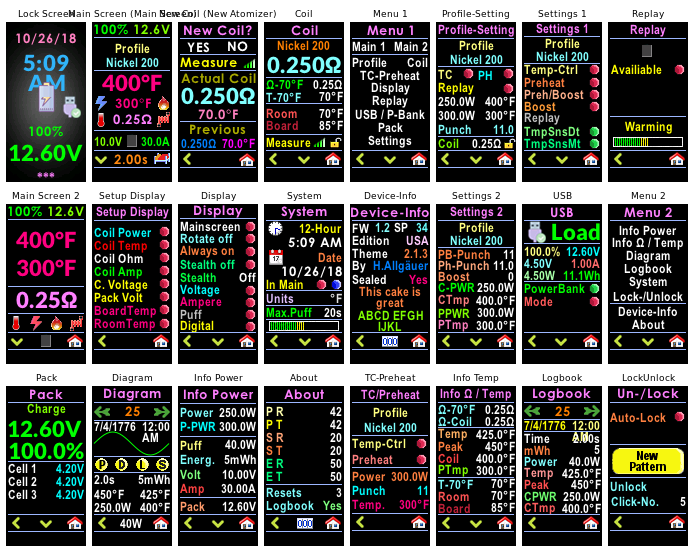 Has your Finder-Mod three or four batteries built in and a voltage greater than 10V? Unfortunately, my 250C-mod has only two batteries, so I can not show voltages above 10V on this - so I have no really test option. But I think I can still fix the mistake anyhow. P.S. at what point is the voltage display displayed in two lines? On which side and where the problem occurse? I have now tried to improve the voltage display in the upper right corner of the main screen and in the upper right corner of the screen "Bad-Eyes". Was the missformatted Value at this point? Could you please test the - attachment - below improved version 2.0.8, if the display on your Finder-Mod is correct now? Natürlich werde ich das reparieren. Bitte gib mir ein paar Tage Zeit (bis 16.09), dann kannst Du ein - hoffentlich - fehlerfreies Update meines Themes herunterladen. Darf ich fragen, ob Dein Finder-Mod drei oder vier Akkus beinhaltet mit einer Spannung von mehr als 10V? Leider hat mein 250C-Mod nur zwei Batterien, so dass ich keine Spannungen von mehr als 10V damit anzeigen lassen kann und damit keine wirkliche Testmöglichkeit habe. Aber ich denke, ich kann der Problem trotzdem lösen. P.S. an welcher Stelle wird die Spannungsanzeige auf zwei Zeilen angezeigt? Also auf welcher Seite und an welcher Stelle? Ich habe jetzt mal versucht, die Spannungsanzeige oben rechts in dem Mainscreen und oben rechts auf dem Screen "Bad-Eyes" zu verbessern. War es an dieser Stelle? Könntest Du die - als Anlage - beigefügte verbesserte Version 2.0.8 bitte testen, ob damit die Anzeige auf Deinem Finder-Mod korrekt ist? so far best but the ui could be better. seems very complicated when using for the first time. Thank you for this information. Can you gimme some suggestions, what I could make better or easier, for more useful handling? What specially is complicated? Was it just in the beginning hard to use or is it still unclear? What do you wish to have more comfortable using?